I've never heard of these Phil but glad to hear you rescued the recipe from potential disaster! I'm sure they must be great dipped in a nice warm cup of strong coffee? They look a bit like a cross between a scone and a biscotti! Glad you kept trying and managed to make the recipe work. Kate - thanks for reminding me - they do dunk well into tea or coffee. The hint of orange may not be to everyone's taste when combined with their favourite beverage, though. I have not seen these before - I will look out for them next time we are chez nous. They look tasty - especially as they are flavoured with orange flower water - très chic! Oops - forgot to add - good for you, not giving up until you got it right. 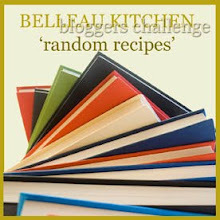 I would have been tempted to cheat and pick another random recipe - but don't tell Dom! Well it's never cheating if you're striving for perfection! I love the recipe. It does sound rather scone-like. Are they hard or soft? They look excellent and thanks for taking part this month! I haven't heard of these before either. They sound and look good though. Good tinkering! Dom - these aren't hard like biscotti but neither are they soft like scones. They're somewhere in-between.The closest comparison I can think of is some of the chewier forms of British gingerbread - but without the ginger. What an interesting recipe, I've never heard of navettesa before now. They sound like the perfect bake ahead dessert accompaniment, think I might have to give these a try! Really intrigued to know what these taste like as I thought they must be scone like then just read your comments. The orange and lemon flavour sounds lovely. Phil, these look gorgeous. They remind of a biscuit we have back in India, and I can see the texture being very similar. Thank you for sharing, and I love the story too. linked over from dom's! these look delicious! I've never heard of them before, so this is a first for me! I'd never heard of navettes. I guess that's the joy of these challenges, you always discover something new. It always distresses me when published recipes don't work, such sloppy work given people are paid to write them when so many great food bloggers write for free. Am so intrigued by these little biscuit breads! I have never used orange blossom water - bet the hint of citrus is just wonderful! Sticking to a faulty recipe can be soo rewarding when you solve the mystery of a bad edit ... good for you!